Sugars are organic compounds that occur naturally in most plants. The sweeteners that we use daily are produced from sugar cane, sugar beets, corn, fruit, honey, agave, maple, and fructose. Sucrose, is the granulated form of sugar that we eat and it is a compound of fructose and glucose. Glucose is turned into glycogen and stored in the cells for energy. If there is too much of it, it is turned into fat. Fructose is the sugar that is found in fruits and some vegetables, it is metabolised by the liver and it does not raise insulin but does raise the hormones that increase appetite, which in turn can lead to fat gain. Sugar influences the same “feel-good” brain chemicals (serotonin and dopamine) as illicit drugs do. However, there is no conclusive scientific proof that sugar is addictive but a lot of research suggesting that it is. 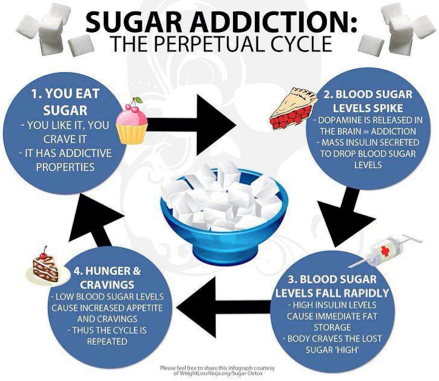 Whether you term it an addiction or a habit, sugar does influence brain chemistry. Sugar alters the brain receptors that regulate how much we eat. In laboratory studies, rats that binged on sugar had brain changes that mimicked those of drug withdrawal. In humans, just seeing pictures of milkshakes triggered brain activity similar to that seen in drug addicts. The activity was stronger in women with a high food-addiction score than in women who didn’t report addictive eating. When you eat carbohydrates they are converted to glucose in your bloodstream and your blood sugar levels rise. Simple carbohydrates (sugars) are absorbed quickly and can cause a blood sugar to spike if eaten on their own (as in having a chocolate bar snack mid morning). Your pancreas reacts and releases the hormone insulin to move the glucose out of the bloodstream and into your cells, which causes your blood sugar levels to drop. When you have a very high spike followed by a very low drop, you will get hungry again. Low blood sugar leaves you feeling shaky, dizzy and craving for more sugar to regain that “high.” The body also thinks that there is a mass of energy available – so it stops burning fat and stores it instead. Pasta, bread, potatoes are starchy (complex) carbohydrates. When they are eaten the body breaks them down into simple sugars. If they are eaten alone, without protein and fibre, these refined starches (white flour, white rice, pasta and potatoes) can trigger the same blood sugar spike as sugary foods. Going on a complete sugar detox that includes cutting out fruit will purge your system of sugar but it is usually too drastic a measure to be sustainable. There are some benefits to eating fruit. All fruits contain vitamins, minerals, and antioxidants, which help metabolise fructose. The fiber that is in the fruit also slows down the absorption of glucose. You can wean yourself off sugar, and train the taste buds to enjoy foods that are less sweet. Gradually eliminating sugary foods from your diet each week over a period of time will help you to lose your cravings and dependence on sugar. Try fresh fruit, which can also be juiced or pureed. Dried or frozen fruit is better than sugary desserts. When you first cut back on sugar, you may experience withdrawal symptoms such as feeling tired, lethargic or on edge. This may last up to a few days. When you are really hungry and are looking for a quick fix try eating protein rather than crisps and biscuits. High-protein foods digest more slowly than simple carbohydrates, so you feel full for longer. Protein does not make your blood sugar spike like refined carbs and sugars. Choose healthy sources of lean protein like lean chicken, eggs, nuts, natural yoghurt, or beans. Fibre also helps to keep you feeling full. High-fibre foods provide energy but without raising the blood sugar as high as simple carbohydrates. So there is no hunger crash afterward. You should have soluble fibre that is found in fruits and vegetables, as well as some insoluble fibre from whole grains. Honey, brown sugar and evaporated cane juice are all still sugar and they cause your blood sugar to rise. Honey and unrefined sugars are slightly higher in nutrients than processed table sugar, but they still have the same effect on body fat. Sugar is hidden in many foods, ketchup, pasta sauces, reduced-fat salad dressings and yoghurts are all often loaded with sugar. Always check the label of any packaged food.